Amye Tevaarwerk, MD, obtained her medical degree from Washington University School of Medicine and completed an internship and residency in internal medicine at Barnes Jewish Hospital. Prior to entering clinical fellowship, she worked as a hospitalist for a year at Barnes Jewish Hospital in St. Louis. She completed a medical oncology fellowship at the University of Wisconsin. Her academic area of interest is breast oncology, with a focus on new drug development and women’s health issues as they relate to cancer survivorship. 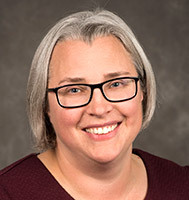 Dr. Tevaarwerk is a member of the UW Health Breast Center and part of Breast Disease-Oriented Working Group, through which multiple clinical trials in breast cancer are helping to find better treatments for those with cancer. Dr. Tevaarwerk’s research interests include breast oncology and Phase I clinical trials.